By Thomas Trappler. 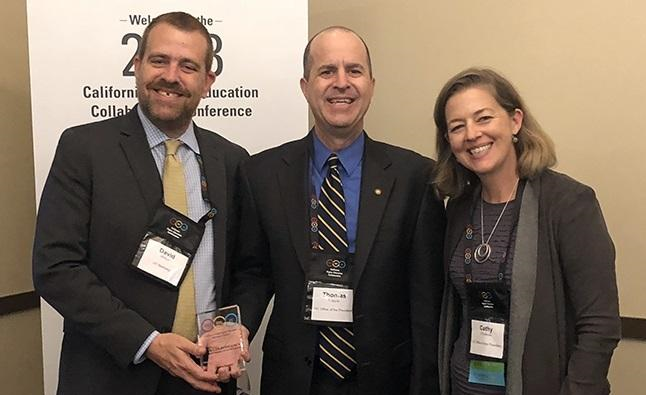 At the California Higher Education Collaborative (CHEC) conference on October 1, 2018, David Willson, manager, Strategic Technology Acquisition at UC Berkeley, and I accepted a Focus on Efficiency award on behalf of the whole UC IT strategic sourcing community. The award recognizes UC for creating a partnership between the UC procurement and IT communities that has successfully improved the effectiveness, efficiency, and outcomes of IT strategic sourcing efforts UC wide. The CHEC conference is intended for professionals from California’s three public higher-education segments to exchange ideas and practices, and learn from each other with the goal of improving administrative performance, service, and outcomes. So this award is quite an honor since it’s coming from our peers. Over $500M/year is spent across UC on IT products, from over 3,400 suppliers. Budget and purchasing decisions are made by departments, and not at the campus level. When locations have needs in common, they often are on differing timelines. Locations have varying tolerances for risk. Stakeholders are broad and diverse, including IT leaders, procurement leaders, subject matter experts, and business process owners using IT products. Stakeholders do not all report to the UC chief procurement officer or the chief information officer. Establishing the UC IT Sourcing Committee (ITSC) to identify and prioritize UC wide IT strategic sourcing projects, and to identify appropriate project team members. Establishing the UC IT Sourcing Roundtable (ITSR) to improve collaboration between IT and procurement professionals both locally and UC wide. Enhancing collaboration between campus and health locations on IT sourcing initiatives. Expanding relationships with security, accessibility and sustainability SMEs. Developing, negotiating, implementing, and disseminating UC wide IT sourcing initiatives, resulting in agreements that align with UC’s needs, mitigate risk, reduce cost, and provide UC-wide benefit. Establishing guidance regarding the appropriate role (for example, facilitator, advisor, broker, strategist) for the UC IT Strategic Sourcing Center of Excellence on different IT sourcing initiatives. Continuously seeking, developing, and executing on opportunities to improve existing agreements and further reduce total cost of ownership, and to improve existing practices and procedures to enhance productivity. Identifying potential IT strategic sourcing projects earlier in their adoption life cycle to be able to source when UC has the most leverage. Pursuing active engagement between UC’s IT and procurement leaders, partners, and key stakeholders, as well as individual IT SMEs and the business-process owners who use IT products and services to achieve specific UC goals, and to effectively understand and address their needs. Working with suppliers to explain UC’s environment and needs, so that suppliers may effectively structure their responses and offers. The financial benefit resulting from the efforts of this improved ITSS collaboration totaled $40,907,132 in FY18, an increase of over 66% from the prior year. Photo: David Wilson; Thomas Trappler (author); Cathy O’Sullivan, chief of staff to the chief operating officer, UC Office of the President. 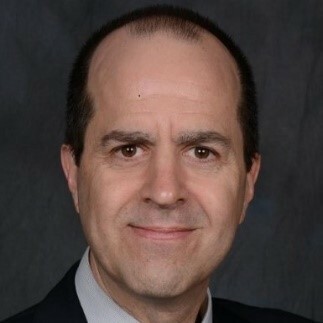 Thomas Trappler is associate director, IT Strategic Sourcing Center of Excellence, Procurement Services, UC Office of the President.